Prime Minister Narendra Modi on Tuesday tore into the Congress-headed UPA, blaming its "appeasement politics" for the inability of the law-enforcement agencies to rein in terror activities while it was in power. The bogey of Hindu terror was raised to misdirect investigation, he said at a poll rally here. Addressing a rally in this central Bihar town which had once been a hotbed of naxal activities, Modi said the same "Mahamilavat (highly aduterated) gang" (the opposition alliance) was responsible for the surge in ultra-Left actvities which his government has quelled through effective security operations and efforts to reform those involved in it. The country used to be rocked by terrorist bomb attacks with alarming frequency in all corners Gaya, Delhi, Ahmedabad, Hyderabad, Mumbai, Varanasi. There was a sudden drop in such incidents after May, 2014. The change was not brought about by me. You effected this change through your vote, he said, evoking a huge round of applause. The government machinery was the same but what changed were style, policy and will of the government, he said. Our agencies were not lacking in ability even before we came to power. But they were not allowed to work on account of the appeasement politics of the previous government. And to misdirect the probe (bhatkaane ke liye), the bogey of Hindu terror was raised. In a case like Samjhauta Express blast, the role of Pakistan was completely brushed under the carpet, the prime minister alleged. Modis comment came in the backdrop of all the accused, including Hindu monk Swami Aseemanand, being acquitted in the Samjhauta Express blast case by an NIA court. Much has been accomplished and much more remains to be done. I assure you that all incomplete works will be completed by this chowkidar of yours ... with whom members of the Mahamilavat gang and sympathizers of terrorists, have a problem, Modi said evoking hysterical applause. Exuding confidence, he said "Modi will form the government again. Countrymen and Indians abroad are blessing the chowkidar" and thanked the people for giving him and BJP the chance to serve them. Taking head on Congress president Rahul Gandhis chowkidar hi chor hai barb, the prime minister alleged the opposition had disdain for those who earn their livelihood through hard work. These people (opposition) have only disdain for those who earn livelihood through hard work. Be it a chowkidar, a tea-seller or a sanitary worker. When they saw that I was wearing the epithet of chowkidar as a badge of honour, they demonstrated their snobbish mindset by calling me a watchman of toilets. "When I wiped the feet of safai karmis at the Kumbh, abuses were heaped on me. Is it not an insult to you ?, Modi remarked at the venue which, incidentally, falls in a reserved constituency. 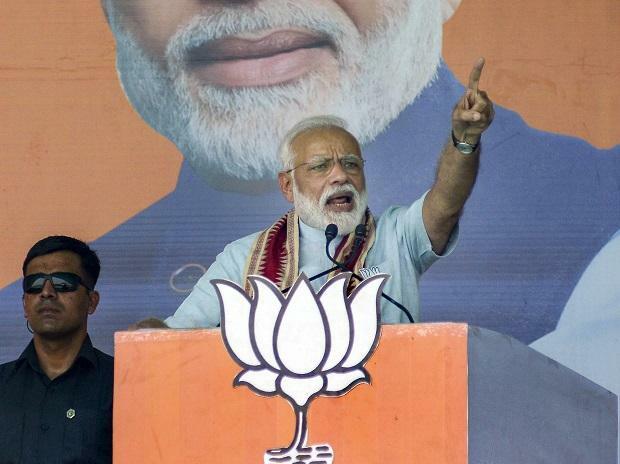 Speaking at a rally where Bihar Chief Minister Nitish Kumar and Union minister Ram Vilas Paswan were also present, Modi lauded the progress made by the state under the NDA, which has been in power for over a decade. Had you not voted out the previous government, Gaya would have needed many more Dashrath Manjhis, he remarked. Dashrath Manjhi, referred to as Mountain man, was a famed stone-cutter from the district who flattened a hillock by toiling away for years just with a chisel and a hammer to carve out a road to make his village more accessible. Modis reference to Manjhi was a veiled attack to the poor infrastructure for which the state had been notorious under the RJD-Congress reign. The Prime Minister said that development projects in the area had been neglected during the UPA rule and were now being resurrected by the NDA government. The delay has, however, resulted in manifold cost escalation of pending projects. He also said that under the NDA rule, tourism has risen by 1.5 times which has brought in money in the area and led to growth of shops and businesses. Modi's two election rallies in Bihar during the day, at Jamui and here, were held in constituencies being contested by allies JD(U) and LJP a pointer to cohesion in the ruling NDA.